Windows 10 version 1903, the next feature update for Microsoft’s Windows 10 operating system, may display a prompt to users to link more of their devices and services to the operating system and their Microsoft account. The prompt, “Let’s make Windows even better — this should not affect what you’ve already set up”, is displayed in recent Insider Builds of Windows 10. There is a chance that Microsoft will change how it looks or what it offers, or even pull it completely based on feedback that it receives. The prompt is loaded automatically on first start of the system. It suggests the setting up or linking of features, devices, or services. The prompt is completely optional at the time; users may hit the “skip for now” link to skip it and continue to the Windows desktop. It lists the following five services, that is what Microsoft calls them, that are powered by Microsoft accounts. Considering that these services require a Microsoft account, it is possible that users who sign in with a local account don’t get to see the prompt. Services that are set up already are not affected by the prompt and skipped. If you have not linked your phone and your PC yet, you are asked to enter your phone number on one of the prompts. 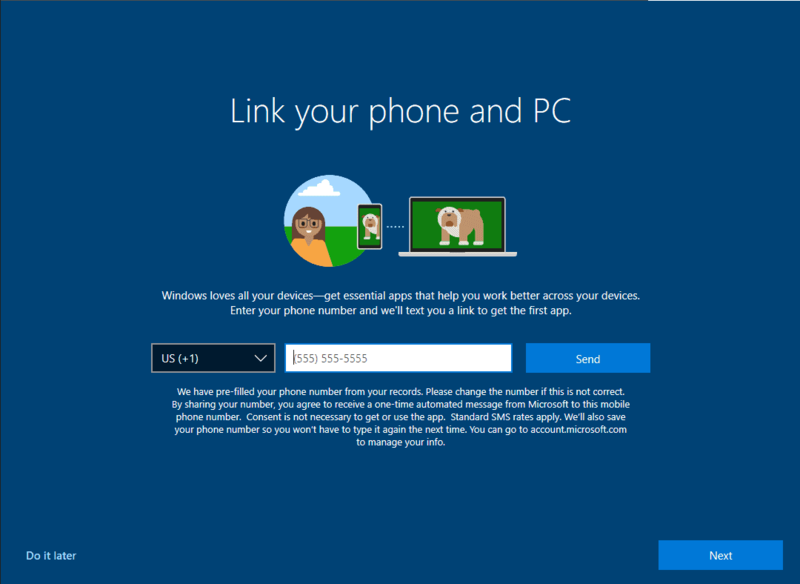 Microsoft would text a link to the entered phone number that contains a link to an app that users could install on the device to link it to the Microsoft account. A click on do it later skips options. Why is Microsoft doing that? There are two sides to the explanation. Windows 10 users may benefit from tighter integration between devices and services, and the prompt highlights features that some users might be unaware of. Setting up Windows Hello may lead to a sign-in experience that is more comfortable, and linking smartphones to Windows 10 devices may open up the possibility to exchange some data between those devices. Second: linked devices and services are valuable to a company that bases many of its decisions on data and the interlinking of services and devices. Now You: Is the new prompt useful? 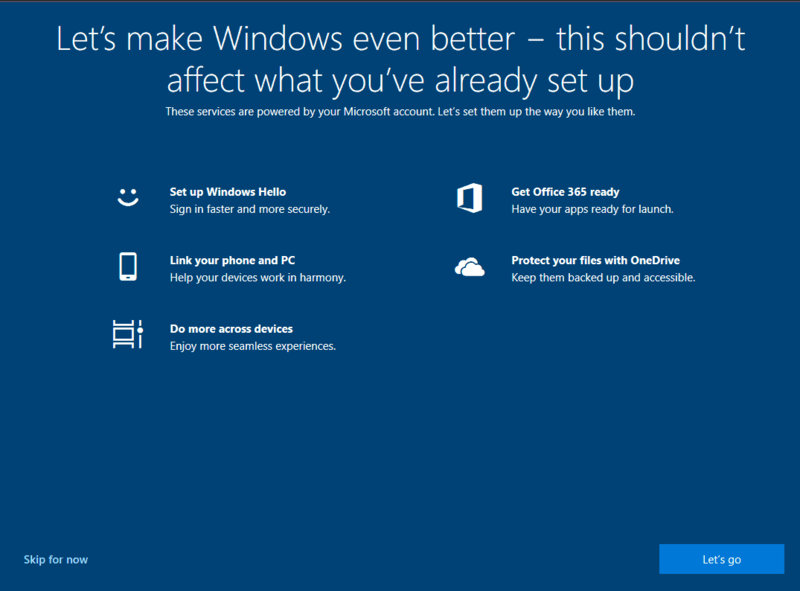 Windows 10 version 1903 may display a prompt to users to link more of their devices and services to the operating system and their Microsoft account.